Much of Alaska has been seeing blue over the last couple of weeks. An upper level ridge over the Bering Sea has kept the active, transitory storms to the far west. I added “transitory” because we are not without active weather, it is just active and static. There has been a strong low in the Northeast Pacific for at least two weeks with strong offshore flow almost uninterrupted for the southeast and south coast. Here’s three representative surface maps, from Dec 6, 13 and 18. In between those dates the low has looped north close to Prince William Sound and been fortified by absorbing other lows, but essentially it is the same low, powered by the contrast between the relatively warm water of the North Pacific and the cold air coming over the upper level ridge and off the cold land mass of Alaska. So, to be more upbeat, there are some wonderful astronomical sights to be seen in the northern skies (not to mention the aurora borealis). 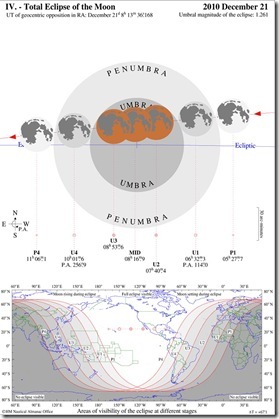 One of them will be the total lunar eclipse this coming Monday night, Dec 20th (Alaska Time). Alaska (and all of North America) is on the best part of the globe for viewing this eclipse. The moon will be well up in the sky, clear of the mountains, and you don’t have to stay up super late. The first part of the eclipse (penumbral) starts at about 8:30 pm AST, gradual darkening the disk with a copper coloration. At the about 9:30 pm AST the umbral phase begins, and the disk will darken more dramatically, first a bite from the side, then the whole disk or totality. The total phase lasts over an hour from 10:40 to 11:54 pm, then the reverse sequence occurs. To add to the spectacle, the moon will be just above the wonderful winter constellation Orion. And to be even more upbeat, the weather looks like it should be pretty clear for much of Alaska. Check the latest forecast for your area, and don’t forget to bundle up well. 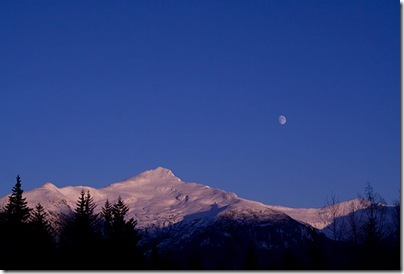 What Do(es) the Coming Winter(s) Have in Store for Alaska?